Successes for Champs RC Sculling + Sweep Rowing crews in the Rob Roy Small Boats Head, 01/10/16. Champs had their biggest ever entry into this event on our home water with 15 sculling crews (many in their first race) + 1 sweep oar crew. The conditions were good and much drier than forecast despite the downpour during Division 3. 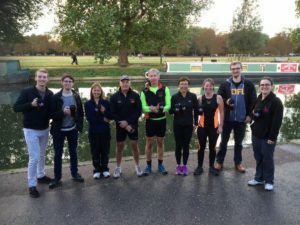 There was a fantastic win for our new recruits to sweep oar rowing, A Men IM3 4+ crew, who were the fastest Champs Crew and 15th overall fastest. The scullers also had a good day with wins for Trish Reed+Steve Millar (Mx.MasCDE.2x), Phil Jones (MasEF.1x), Louise Affleck+Carole Mills (W.MasCDF.2x), Louise Affleck (WMasC 1x) and Carole Mills (WMasDE 1x).